I’ve not reviewed the first two expansion packs for The Sims 3, but here’s a review for the third, Late Night. Is it a hard-partier, or should you give it an early bed time? 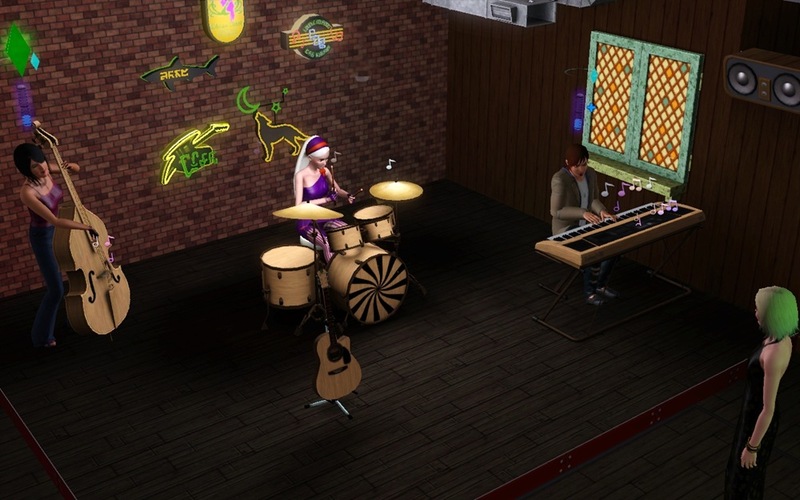 There’s just something entertaining about the premise here: take your sim around a new, big-city neighborhood to party late, hit the bars, and start up a band. If only there was a Sims 2: University-like option to throw them in college, this would be perfect. Let’s tackle each of the primary goals, one at a time. The late night excursions you can go on are tied tightly to your sim’s stamina. If your sim gets tired early, your experience here won’t be very fulfilling. It almost takes a complete rearranging of your daily schedules to take part in the festivities. What there is is fun, but a little dulled by The Sims series’ adherence to family friendly gameplay (in other words, it’s very PG-rated). You can play group games like darts, eat bar food like hot wings and grab a drink or man the bar yourself. Some places are gated by the new star level, only letting in the biggest celebrities. Raising your own star level is most easily done by befriending the various celebrities that inhabit the neighborhood. The higher the star level, the harder they are to impress. Another way to raise your star level is to start a band. Starting a band is more involved. You need to find – on your own – a few other sims to fill out your group, get them to practice, and then wait for a gig to call upon you. That’s right, you can’t seek out work, work has to come to you. This sitting-on-your-hands state is pretty frustrating, especially when your band members keep skipping practice, so you can’t even improve your band. Even worse is when band members don’t show up for your gigs, which hurts your performance. In the new neighborhood, you can live in a house like usual or you can move into an apartment. Unfortunately this is nowhere as immersive as The Sims 2: Apartment Life. Yours is the only apartment you can see your building so you don’t have immediate neighbors. This really hurts the impression that your living in an apartment. The last big feature is the return of vampires. Whereas The Sims 2 added new creatures each expansion pack, this is the first for The Sims 3, and sadly they aren’t allot of fun to interact with or play as. They also fall under the family friendly umbrella, so there’s no feeding on the living or the weak. I have to ask, then: why be a vampire? I don’t see a clear answer. There’s nothing here in the audio or visual department that will surprise or even impress any one who played has played The Sims 3. Most of the nicest goodies are for sale on The Sims 3 website, so don’t expect allot more then the basics for the different features. The big city neighborhood you live in is almost the packs worst feature. The subway system they included makes walking easier, but it’s so big and cumbersome that it alone seems to increase the system requirements for running the game well. The large, tall buildings can make seeing things at ground level pretty hard at times. Lastly, yes you will have to make new sims or move old ones into the new town to enjoy most of the new features of Late Night. Late Night seems like a filler pack to me, just adding things that perhaps should have been in the game originally, or at least sooner. The nocturnal adventures can be fun if you get to enjoy them, but expect some measure of frustration along the way. I’d recommend the previous pack, Ambiitions, over this one, so keep that in mind. Late Night could use some polishing, but can still be a good time for avid Sims fans. Alphasim out.